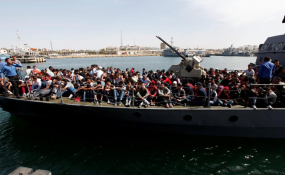 Migrants arrive in Tripoli (file photo). Search and rescue ship Aquarius, which has saved tens of thousands of migrants from drowning in the Mediterranean, has ended its operations, the charity that runs the ship, Doctors without Borders (MSF), said on Thursday. MSF and its partner SOS Mediterranee said they were forced to terminate its operations due to a "smear campaign" by European governments. "This is a dark day. Not only has Europe failed to provide dedicated search and rescue capacity, it has also actively sabotaged others' attempts to save lives," said Vickie Hawkins, head of MSF UK, in a statement. "The end of Aquarius means more lives lost at sea; more avoidable deaths that will go unwitnessed and unrecorded. It really is a case of 'out of sight out of mind' for UK and European leaders as men, women and children perish," she said. Nearly 5,000 migrants died in 2016 while trying to cross the Mediterranean from Africa and the Middle East to flee war and poverty, according to the U.N. agency International Organization for Migration (IOM). The charity denied any wrongdoing and accused Italy of seeking to criminalise humanitarian search and rescue missions. The public prosecutor's office in Catania, Sicily, said it believed crew on the Aquarius, and its sister ship VOS Prudence, had illegally dumped potentially dangerous medical waste among ordinary rubbish between January 2017 and May 2018. The Aquarius, which was launched in 2015, at the peak of the migrant crisis in Europe.